Sofie is a UK ARB registered architect. Sofie Pelsmakers, originally from Belgium, has lived and worked in the UK since 1997 and is a chartered RIBA architect. From October 2001 to July 2011 she was a senior lecturer in Environmental and Sustainable Design, both at undergraduate and postgraduate courses, at the University of East London (UEL). 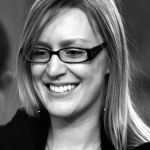 From January 2009 to the end of July 2011, she was Programme Leader of the MA Architecture: Sustainability & Design. She is author of the Environmental Design Pocketbook published by the RIBA in March 2012. The Environmental Design Pocketbook has received commendation for the 2012 RIBA President's Award for outstanding practice-located research! (December 2012) and its author, Sofie Pelsmakers has been listed among 12 'Women influencing Sustainable Architecture' by AJ Footprint (January 2013) and as 1 of 100 top Twitter influencers in sustainable construction, design and the built environment (Ecobuild 2012) and in the top 10 of BDtwitter100 2013 and BD's top ten sustainability tweeters (2013).Sofie was 'highly commended' for the UKGBC/PRP 2013 inaugural Rising Star award. The judges said: "Congratulations also to Sofie Pelsmakers, Architecture for Change and UCL Energy Institute who the judges thought deserved to be highly commended for The Environmental Design Pocketbook. In 2012 Sofie published the book, a practical guide which uses an innovative approach to communicate better green building approaches to architects. The judges were impressed by Sofie’s ability to take complicated principles and communicate them in a way that is relevant to the target audience, to both promote and enable change." Sofie is currently undertaking an EPSRC funded PhD at the UCL/Loughborough Centre for Doctoral Research in Energy Demand at UCL's Energy Institute. Sofie has also worked with the UK Passivhaus Trust and has undertaken freelance consultancy work for, amongst others STBA, Cytex/DEFRA, CABE and architects Levitt Bernstein, where she also worked as an architect and environmental designer from 2003 until 2007. Sofie has extensive experience of the design & construction of both new build as well as refurbishment projects of different scales. Sofie was invited to present and run workshops at SusCon, the Building Centre, the UK Passivhaus Conference, Ecobuild and at The Science Museum's DANA Centre. She has guest lectured at Nottingham Trent and UCL. Sofie's special interests include the challenges of future proofing buildings to account for predicted climate change. At present, Sofie is conducting research with regards to the environmental improvements to the UK Victorian housing stock. She has also contributed to the environmental and sustainability section of David Levitt's 'Housing Design Handbook', published in September 2009. Sofie is a also a member of Sponge, RESET and AECB Sofie's blog can be found here.